The technology that fueled the creation of Invisalign has been around since 1997, and it has continued to improve over time. Today, Invisalign is a very effective and affordable option to straighten your teeth. Dr. Browne and Dr. Crowley are both able to provide this treatment to patients at Montana Roots Dental Care. If you want straighter teeth and you are looking for an alternative to braces, Invisalign could likely be a very good option for you. Invisalign is able to treat most cases that patients have, but not all. Invisalign has also become increasingly popular with adults that are looking for an alternative to adult braces. Removable. Trays can be removed for eating and to clean teeth. Aesthetics. Most people prefer these to braces because they are virtually invisible. Transparent. 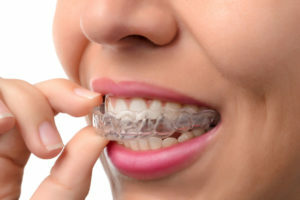 The transparent trays are generally easier to hide than braces. Short Treatment Time. The total treatment time is usually comparable to braces, and sometimes even faster! Easier To Lose. When you don’t have brackets glued to your teeth, you would be surprised how easy it is to misplace the clear trays. All Day Long. Just like with braces, your teeth move because of consistent gentle pressure being applied to them. Which is why they recommend wearing them for at least 22 hours a day. If you think you might be interested in Invisalign, please contact us, and we will be happy to set you up with a free consultation with Dr. Heidi Browne or Dr. Eddy Crowley. It is very important to us that we help you make an informed decision when it comes to the best treatment plan to straighten your teeth. We are one of the few dental offices in Helena, Montana that offers Invisalign as an option to straighten your teeth. Give us a call (406) 442-0282. Website Designed By SkEye Media Inc © 2018. All Rights Reserved.